How to select your artisans? It is such an important topic !!! Yes, I have been thinking about this article for a long time. Listening to my buyers, my friends’ designers and I think this subject should be well explained. So how and where do we start with? Artisanal products are those produced by artisans, either completely by hand, or with the help of hand tools or even mechanical means, as long as the direct manual contribution of the artisan remains the most substantial component of the finished product. These are produced without restriction in terms of quantity and using raw materials from sustainable resources. The special nature of artisanal products derives from their distinctive features, which can be utilitarian, aesthetic, artistic, creative, culturally attached, decorative, functional, traditional, religiously and socially symbolic and significant. The artisan works in a family team! Uncle, cousins, brothers. You can feel the good family vibe. From generation to another, they have been working in the same handicrafts industry and this is great. In the way, it is also good for you to select this kind of organization since they are experienced for many years and decades. It is trustworthy and you may feel more at peace when you know that all the production is being made in-house, meaning that you would be able to save time, money and effort. The intermediary: they don’t own any workshops, they are not involved in the making process. They are just well connected to the producers. 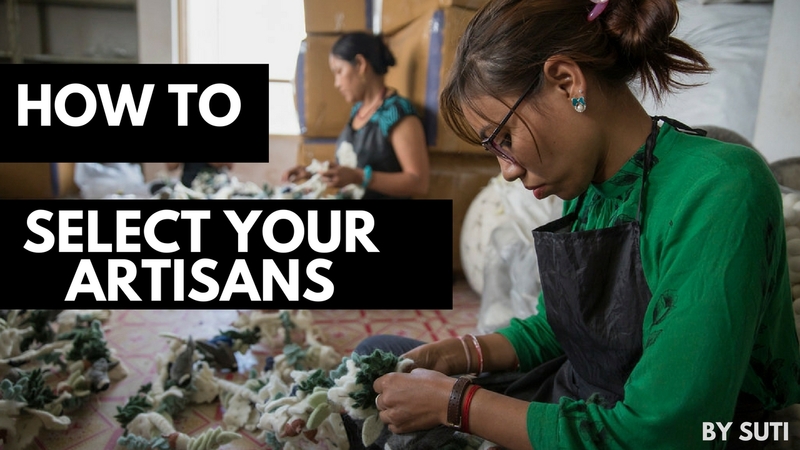 Sometimes there are advantages and drawbacks since you won’t be able to have a direct connection with the artisan’s group; so it is usually not recommended but still can if you would need someone who can coordinate the whole different production you have for one shipment for example. Listening, asking questions to your artisans should be present. Look for what drive the most this artisans…You will be able to understand better why this person wakes up in the morning, what motives her/him and I believe it is important to listen carefully to the artisans. Get the email address first: know your point of contact whenever you need to communicate about the price, a picture of the sample, sending the sample, paying, placing your order, giving feedback, etc…You should also have the backup email address from the same organization. Sometimes you may be surprised, by some of the artisans who wish to communicate with Viber number (yes, this is huge in Nepal!) or the WhatsApp too. Skype is still a good communication tool to check your sample, discuss on the sample or production issue. Yes, we all know this is handmade and it will therefore take time. You also have your own work of selling, marketing your crafts and facing different issues… Then, I would recommend adding additional days/weeks for the unexpected things and delays which can occur in your initial planning/working calendar. At the beginning, you will be experimenting, checking the quality of the samples received and over the time you will be able to say if yes or no, you feel comfortable working with this artisan or another. Go step by step in what you can see can be done and experiment with time new crafts and new improvements on each of the crafts. There is no point of going too fast and trying to push too much the artisan. I hope I have summarized well this HOW#2 and I might, later on, give an update. Thank you in advance for your feedback and feel free to share! Un article que j’ai voulu écrire en anglais mais ne vous inquiétez pas, je me tiens à votre disposition chers lecteurs francophones si vous souhaitez vous lancer et contacter des artisans au Népal. This is super helpful ! I’m visiting Nepal in the spring next year & I’m hoping to meet some artisans that I can source block printing fabric from. Can you recommend anywhere (location/market) /any small company that I should seek out during my visit please? Thank you for your message! I am glad to help you during your stay and beforehand for your research.